WASHINGTON (NASA PR) — Orbital Sciences Corporation continues to make progress in readying the Antares launch vehicle, Cygnus spacecraft and ground infrastructure for two planned flights in the next several months: an Antares test launch followed by a Commercial Orbital Transportation Services (COTS) demonstration mission to the International Space Station. The schedule for Orbital’s testing and flights begins with the final integration and checkout of the Mid-Atlantic Regional Spaceport (MARS) launch pad at Wallops Flight Facility on Wallops Island, Va., currently planned by the end of August. Following turnover of the launch pad, Orbital will proceed into a series of wet dress rehearsal tests and ultimately a hot fire test of the first stage Antares vehicle on the launch pad. These tests are projected for completion in September. 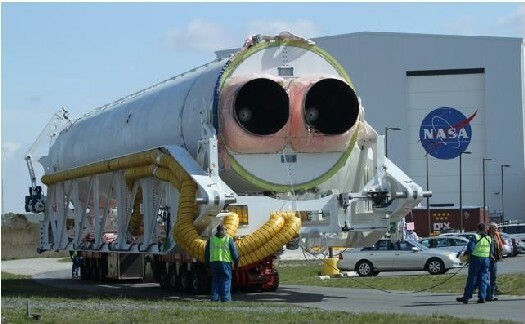 All major vehicle hardware assemblies for the first Antares test flight, including a Cygnus spacecraft mass simulator, are on site at Wallops. The fairing for the test flight is currently scheduled for delivery to Wallops by the end of August. Assuming completion of the MARS launch pad activation and a successful hot fire test, the Antares test flight is currently scheduled for October. Orbital also is making progress on the upcoming COTS demonstration mission to the space station, which currently has a projected launch in December. The Cygnus spacecraft is nearing completion and all major Antares vehicle elements are either at Wallops or at Orbital’s facility in Chandler, Ariz. The second of two Antares AJ-26 engines is at NASA’s Stennis Space Center in Bay St. Louis, Miss., and a test firing occurred successfully on August 16th.